All works included in this gallery are copyrighted by the original artists and are protected by national and international copyright laws. No works are to be copied, downloaded, transmitted, duplicated or modified in any way. The meadow: green in spring, gold in summer, brown in fall, white in winter, everlasting, ever-changing! Hartlik welkom! A warm welcome! ‘n Groep vir almal. Skryfwerk, groetekaartjies en woorde op T-hemde mag in Afrikaans of Engels wees. Foto’s en kuns: alles wat die tema AFRIKA, uitbeeld. Datum waarop groep begin het: 12 September 2010. 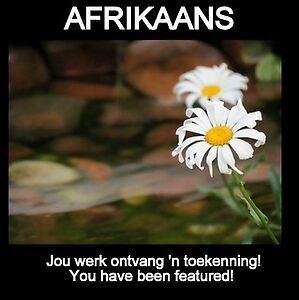 Starting date of AFRIKAANS: 12 September 2010. Photos and artwork welcome: wildlife, nature, anything African – PLEASE STATE THIS IN YOUR DESCRIPTION. 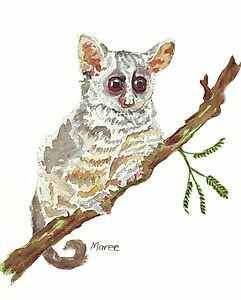 Pippin, the bush baby – Maree Clarkson. 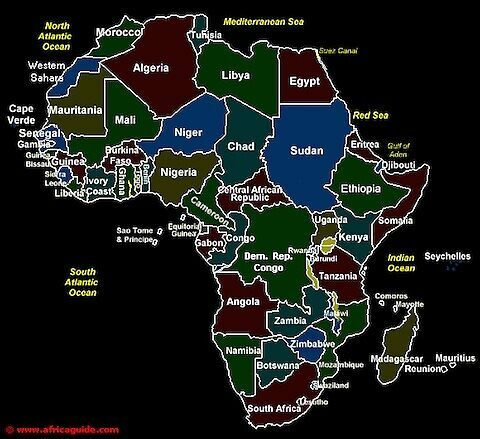 South Africa is situated right at the bottom part of Africa.